Opossums frequently inhabit attics. Opossums have opposable thumbs, and are great climbers. Like most animals, they are just looking for a nice, safe shelter in which to live. And like most animals, they eat food and excrete waste. Opossums will use your attic like a regular toilet. I've been in some attics filled with over 1000 smelly opossum terds. Possums go to the bathroom (your attic) everywhere! In some cases, the contamination can be severe. Here's a photo from one attic that had opossums living inside. Look at all of the droppings. The house smelled pretty bad, and it was unsanitary. 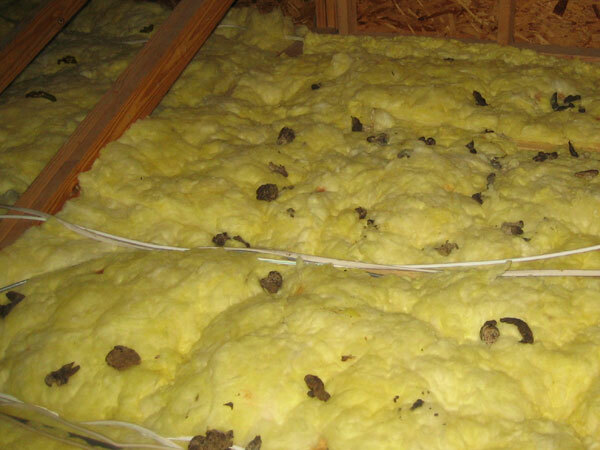 Here's an even worse attic, from an even worse-smelling house. How could the residents let it go on this long without having the problem taken care of? If they'd had the opossum trapped and removed right away, it wouldn't have had time to convert the clean insulation to sewer quality. I recommend attic decontamination services in a case such as this, if not complete insulation removal and replacement. Complete attic restoration will eliminate the unsanitary and potentially dangerous state of the attic, full of odor, disease, and parasites - plus the smell that could attract new wildlife. PHOTOS: For great pictures of bat trapping and removal, click on my: Opossum Photographs gallery. For more opossum trapping information, go back to the opossum control page or read How to get rid of opossums in the attic. Opossum poop – the things you ought to know! When you have a wild animal living in your home, there is not just the noise or food stealing that you have to concern yourself with; there is always the worry of disease, especially when you take into consideration the amount of poop and urine that these creatures can leave behind. Take the lowly opossum for example, an animal that normally weighs less than fifteen pounds – this creature can leave poop that is as big as that left by a dog, and twice as smelly! This is one of the biggest issues facing people with an opossum living in their homes – you must get rid of the poop and urine once you have managed to effectively shoo the creature and persuaded it to reside somewhere else. The urine and feces will stain anything that it has come into contact with, and at the same time, you may want to think about having a wildlife control expert in to give you a hand with the removal as there are a couple of disease associated with the droppings left behind by this animal. As well as Salmonella and something called leptospirosis, opossum poop can also be dangerous because of a neurological disease that normally affects horses, which goes by the name of EPM or equine protozoal myeloencephalitis. This isn’t going to be a concern when the animal poops in your home, as such, but if you have barns or outbuildings, you may find that the horses and other creatures can come into contact with the feces and become rather poorly indeed. Opossum in attic – will it leave on its own? If you have an opossum in your yard, you are probably best off leaving it to its own devices as usually, within a couple of days, it will leave. The opossum is a nomadic drifter and will spend most of its life drifting from place to place, foraging for food and generally being its opossum self. However, if you should find the creature in your home, for example, in your attic, you are best off doing something about it. Read more about Do opossums climb well? 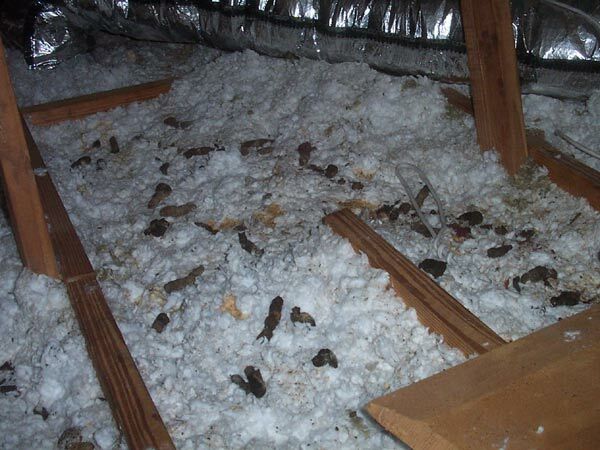 Opossum females will usually create a home in places such as your attic to have her babies in, and you will find that not only will this leave you with more than just one opossum to deal with, but also with a whole host of other issues to sort out. Once the opossum moves into your attic, you will have urine and feces to deal with. This can contaminate the rest of your home, and can contain disease and nasty parasites, which means you shouldn’t just ignore the problem. On top of this, opossums are usually attracted to the smell, so what starts of as one opossum, could end up being a colony of them, and they are territorial which means they will end up fighting. If your opossum mama has babies up there, the babies could very well stay for a long time, some may even stay up until they are sexually mature themselves, around the one year old mark. One final thing that will cause you epic problems if you leave the opossum in your attic to do its own thing is that they very often die up there which is going to cause an awful smell that you will have to contend with, and a decomposing corpse will often attract other animals such as rats. In short – if you have an opossum in the attic, it would be a very wise choice to try and get rid of it!